For routine site setup tasks, import from site (under Site Setup) is the ideal process for copying discussions from one site to another. However, you may also export your discussions as a zip file (IMS CP 1.2 format). The ability to export discussions in a zip file makes it possible for you to share materials with colleagues as well as having local backup copies of your discussion forums, categories, and topics. 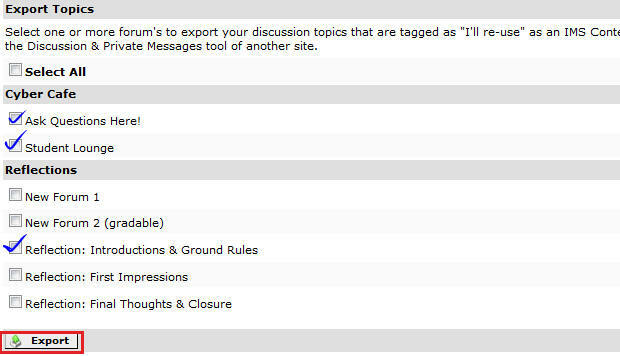 In addition to your categories and forums, any topics marked as ‘I’ll re-use’ will be exported, too, in the zip file. Click on Manage under the discussions that you want to export. Click on Import/Export. That will open the small window you see below. Select the forums you want to export or Select All to export all of them.